Bone grafting is usually required when there is inadequate volume of bone to place implants successfully. 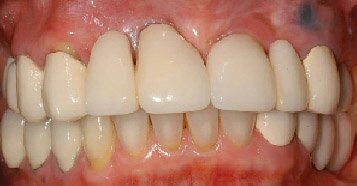 There are many reasons for this such as previous gum disease, natural resorption after extraction, trauma or infection which can all lead to this loss of jaw bone. Dr BS Ubhi has been taught by the pioneer surgeons (who actually invented the procedures) in their field for various bone augmentation procedures. The region of the upper back teeth is known as the maxilla and when teeth are lost in this area, the sinus (air space) which is located in the maxillary bone expands. In order to place dental implants to replace the missing teeth , the bone needs to be built up by grafting techniques. The original pioneer of this procedure was Dr Hilt Tatum (USA) and Dr BS Ubhi spent 30 days with him learning the maxillary bone augmentation techniques in 2001. Since that date Dr Ubhi has performed hundreds of sinus augmentation procedures successfully and regularly performs this procedure for other implant dentists both locally and nationally in the UK. Since 2001 Dr Ubhi has performed hundreds of sinus augmentation procedures successfully. Rebuilding lost jaw bone is neccesary for many cases in which dental implants are required to replace missing teeth. The two main techniques area either using autogenous bone (patient’s own bone) or using the biomaterials (usually animal products). The most esteemed surgeon and pioneer for the autogenous bone type of procedure is Professor F Khoury (Germany) and Dr BS Ubhi was personally taught by him to undertake this procedure in 2009 in San Francisco. The two main techniques area either using autogenous bone (patient's own bone) or using the biomaterials (usually animal products). The other method is by the use of biomaterials and the most successful technique has been developed by a Hungarian Surgeon Dr Istvan Urban and Dr Ubhi has undertook training at his institute in Budapest in 2015. This technique does not require a second surgical site to remove some bone for transplantation. Dr Ubhi has had great success in using this technique. 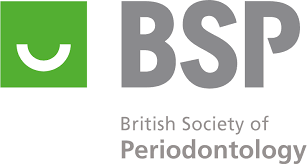 In severe cases where bone grafting cannot be carried out patients can still benefit from dental implantology in the upper jaw by the use of Zygomatic/Ptyergoid implants. This is a very advanced technique by which dental implants are placed in the Zygomatic bone. This advanced technique requires significant preoperative assessment including CT scanning. Professor Luc Vrelonk (Belgium) is the leading European authority on this and has been doing this procedure for over 20 years . Dr Ubhi attended his training programme in Brussels in 2010. 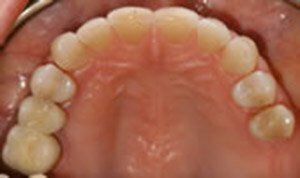 This lady presented with periodontally involved upper posterior teeth. Unfortunately these were not able to be saved. After extraction of these teeth and a suitable period of healing, bilateral sinus bone grafts were done along with implant placement. 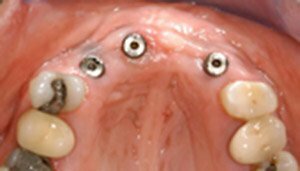 These were left to osseointegrate for 6 months before being restored with screw retained bridgework by the referring practice. This lady was referred for implant therapy to replace missing anterior teeth. Unfortunately there was a lack of bone volume and bone augmentation was required. Block bone graft was done (taken from the mandibular symphisis area) and after a healing period of 4 months, excellent bone width was achieved. 3 implants were placed and they integrated well with soft tissues being noted as being excellent. The final restorations were carried out by the referring dentist. 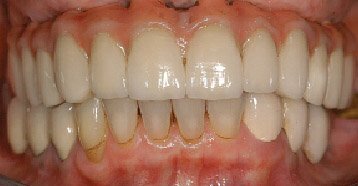 This patient was referred for implant therapy as she had completely failed upper dentition. The implants were placed 15 years earlier by another dentist but were affected by peri-implantitis. In addition she had large infections in the roots and loose bridgework. All these teeth were removed and ridge augmentation carried out. After maturation of the graft, 6 implants were placed in the upper jaw and restored with 12 unit fixed screw retained bridgework in 2006 . The final picture was taken after 9 years in function (2015). The patient has been delighted with the outcome and is very pleased with the aesthetics and function of her new teeth.